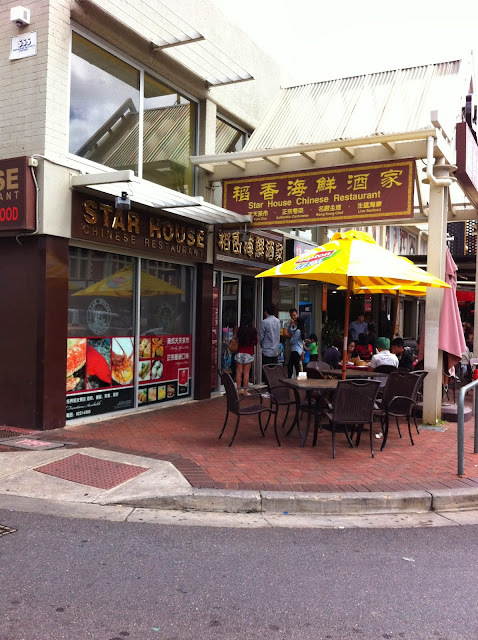 My family and I decided to try out somewhere we had never been for yum cha and settled with Star House. A lot of people were shocked knowing I had never been here and said that they definitely recommended it, so I had rather high expectations. I found that the prawn dumplings had very chewy fillings which is the exact opposite of what I would expect from prawns. Also, I spotted a hair in the dumpling skin. Gross! These were put together very clumsily. The layer of rice flour was very thin on top but very thick on the bottom, which you can see in the roll closest to the left of the fish. Also, they were very inconsistent in length. The one on top would be very long in comparison to the two extremely short rolls on the bottom. I loved these! Prawn filled deep fried bean curd with a tangy sauce. Yum! My parents and grandma loved these. They were deep fried balls of sticky rice with a minced pork filling. We also ordered salt and pepper squid which wasn't as great as some of the other places I've tried. Also, we tried the green beans which were essentially green beans blanched and then soaked in garlic infused oil. They looked really soggy and I couldn't bring myself to eat them! We encountered a few problems with the staff there. A minor thing which is a usual complaint for most people is that some orders or requests are never put through. It took us far too long to have chilli oil on our table. When we asked for soy sauce, a waitress proceeded to tell us that you're not supposed to eat yum cha with soy sauce. Okay then...? We ended up with soy sauce at the table but it was the wrong soy sauce - too dark and rich for yum cha. So disappointing! I don't think we'll be back any time soon and will just play it safe with our favourites, Citi Zen (blog posts here and here) or Ding Hao.